Christmas is well on the way, there are just over five weeks until the big day and we all know how fast those weeks will fly by. One minute you think you have all the time in the world, then the next minute it's Christmas Eve, and there's still half a dozen gifts left to buy. This year I'm attempting to be a little more organised and plan to do most of my shopping online and weeks in advance because let's face it, shopping with two young children is hard work. With this in mind, I was delighted when Boots contacted me, asking if I'd like to take part in their 50 Days of Christmas collaboration. They invited me to browse through their wide selection of Christmas gifts and pick out a couple of gifts for the special people in my life. I was so excited to start shopping because I knew it would start my christmas shopping off with a bang! The most important person in my life, bar my children has got to be my better half Nick, so it was only right to choose a gift for him first. There were so many suggestions on the Christmas gifts for him section, countless gifts that he would have liked but I decided to go with the FatFace Beanie Gift Set which currently retails at £20.00. Included in the set is a FatFace knitted effect beanie, a 200ml bottle of their Black Pepper, Pimento, and Eucalyptus body wash and a 125ml bottle of Black Pepper, Pimento and Eucalyptus body spray. I can see him really appreciating this practical gift, you can't beat a nice winter hat and some smellies at Christmas. It was then time to pick something for a very special lady in my life, my Mum. Again, there was so much to choose from, but I wanted to get her something extra special, just like her. The No7 Beauty Collection was just the ticket, containing so many different beauty products that I knew that she'd use and love. 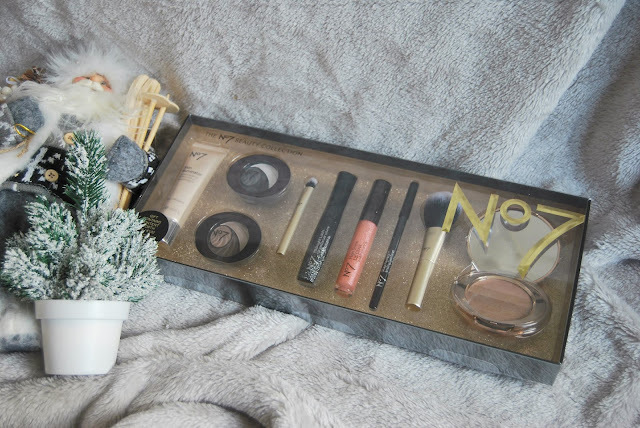 In the set you'll find the No7 Stay Perfect trio eyeshadow palette, No7 Stay Perfect trio eyeshadow, No7 Stay Perfect amazing eyes black pencil, No7 Skin Illuminator, No7 Shimmer Palette, No7 High Shine lip gloss, No7 Midnight Lash black mascara, No7 mini eyeshadow brush, and the No7 mini blusher brush. All these products would cost £76 if bought separately, so it's a steal at just £50.00. My sister emigrated to America a few years ago, so we've not seen each other in a while. The whole family miss her every day, even more so at Christmas time. Although she lives thousands of miles away we make sure to involve her in our festive celebrations by sending her a hamper of goodies to open up on Christmas morning. I chose the Baylis & Harding Beauticology Rockin Robin 4 Piece Bathing Set to send to her as I thought it looked so festive and I think that she'll adore the Christmas scents. The set currently retails at £12.50 and includes a 500ml Frosted Cranberry & Mistletoe Body Wash, 500ml Candy Cane Shower Crème, 100g Iced Snowflake Cookie Boxed Soap and an EVA Body Polisher. Another gift I chose to add to my sisters Christmas hamper was the Little Something Handcream Duo which retails at just £3.00. This little stocking filler contains the Gold Together Hand Cream and Perfect Moments Hand Cream both in 30ml tubes. Fragranced with notes of Amber, Bergamot and Lemon and Sweet Blossom and Rose. Last, but certainly not least I picked out the Belgian Biscuits 800g tin for Noah and Ava's Great Grandma. Inside the large Christmas themed tin is a selection of delicious milk, dark and white belgian chocolate biscuits, wafers and cookies. Nan is partial to a nice biscuit or two and likes to have nibbles at hand for when she has guests so I know they will put a smile on her face. I can also imagine the whole family enjoying a treat or two out of this tin this Christmas day. 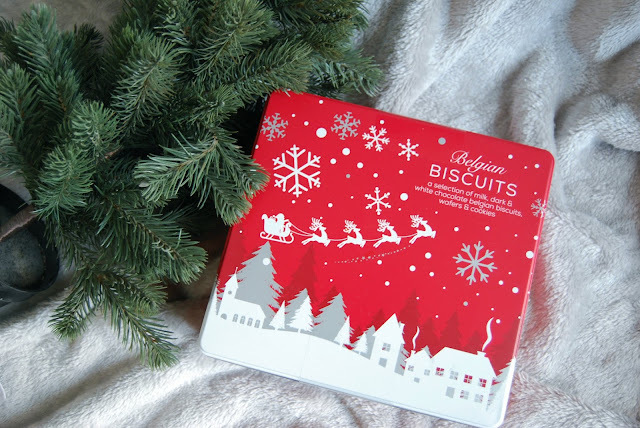 The Belgian Biscuits tin retails at £14.00 and is another gift in the 3 for 2 Christmas mix and match offer. What are you buying the special people in your life this year and would you consider gifting any of these Boots products to them? - This post is written in collaboration with Boots, however, all opinions are my own. Oh wow - the C word! (Christmas) - I haven't even started thinking about it yet, I'm thinking this year will be a last minute job! Boots do lovely gift sets. It's my daughter's birthday at the end of the month so I don't think about Christmas until December. I expect I'll buy everything online to make it easy. Would consider a number of the gifts shown. I love the 3 for 2 offers in boots.